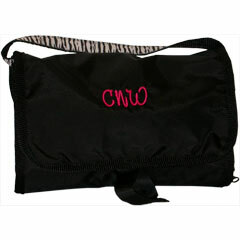 Personalized travel bag is great for kids and adults alike. After all, everyone needs somewhere to stash their toothbrush. Kids will feel grown up with a personalized travel kit which is great for camp, sleep overs and weekend trips. Adults will love the many uses such as a sewing kit, medicine bag, jewelry roll or diaper bag organizer. Both kids and adults will love their personalized tri fold bag.